Amy Ball is a PhD student at the University’s MRC Centre for Drug Safety Science. 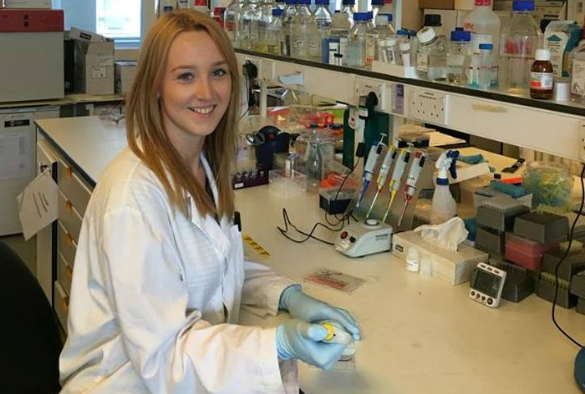 Her project is an MRC Industrial CASE Studentship with GlaxoSmithKline. “Male, female, old, young, short, tall, we’re all different. The majority of these differences are predetermined in our own, unique DNA. Until recently however, differences in a person’s DNA have not been taken into account when they require medical treatment. Instead, a ‘one size fits all’ strategy has been used, leading to ineffective treatment and adverse drug reactions in some people. It is now widely accepted that we need to start taking more patient characteristics into account in order to provide the best medical treatment – put simply, we need to personalise medicine. A large proportion of the adverse effects experienced during medical treatment occur in the liver, and this forms the primary interest of my PhD. Some of these adverse effects can be fatal, but they often only occur in a small proportion of patients taking a drug, so we want to work out what separates these patients from those who can be treated safely. It is thought that adverse drug reactions in the liver may largely depend on damage to mitochondria. These are tiny structures, found in nearly every cell in the body, that are responsible for providing energy, among a range of other roles. They also contain their own DNA, known as mitochondrial DNA. In cells where there is a high energy demand, such as liver cells, large numbers of mitochondria are found and so their dysfunction can have a drastic impact. My PhD project is focused on determining whether differences in a person’s mitochondrial DNA change how well their cells produce energy, and whether in-turn, this makes them more or less susceptible to liver damage after taking certain drugs. In order to do this we have used DNA samples from hundreds of volunteers and identified differences in their mitochondrial DNA. We’re now planning to select a sample of these volunteers to donate their own mitochondrial DNA, which will then be incorporated into liver cells in the laboratory. This technique is still a work-in-progress but I have been helped significantly by a recent two week visit to the University of Leipzig, Germany using a mini-fellowship travel grant from the In Vitro Toxicology Society. These personalised liver cells will then be tested using facilities in both the MRC Centre for Drug Safety Science and GlaxoSmithKline to see how efficient they are at producing energy in their mitochondria and how much they are damaged by drugs known to cause adverse reactions. We are interested to see whether there is a correlation between changes in the mitochondrial DNA sequence of an individual, energy production and the experience of adverse drug reactions.